I always wondered what the inside of a 4p CP with all the buttons wired to RGB LED's would look like. Now I know. Yikes. That's gotta by a half mile of wire in there! Fun stuff! 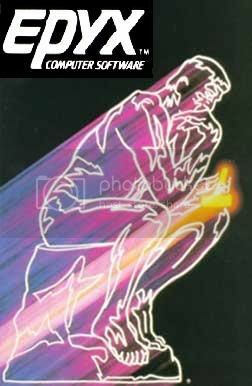 I like the "burning money" artwork. Good grief that's messy wiring! Hope you never have to trace an electrical problem. Cool artwork though. Finally... It is functional and ready to show here. The cp for my 1st build. 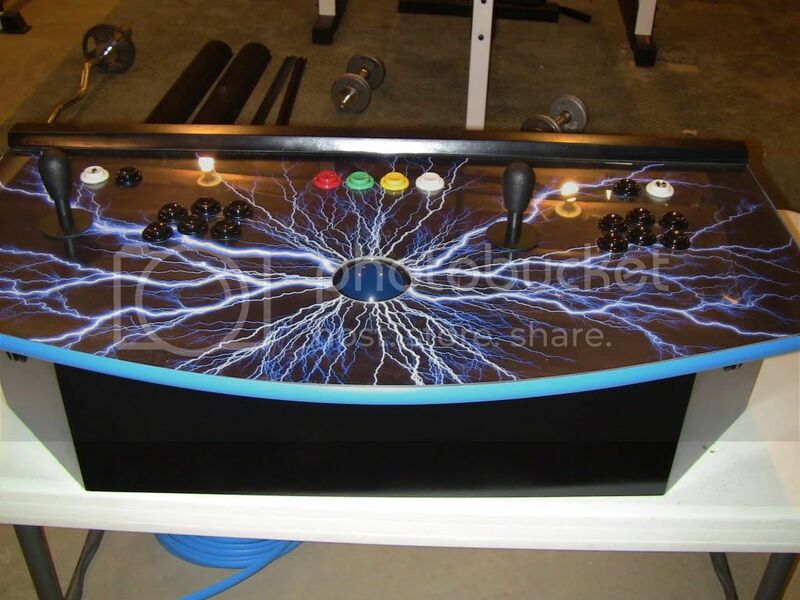 4 player 'Fusion' cab. 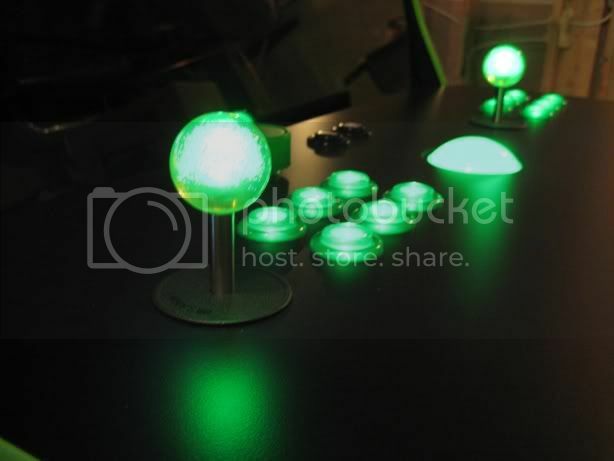 The p1&2 Switchable joysticks have indicator leds. 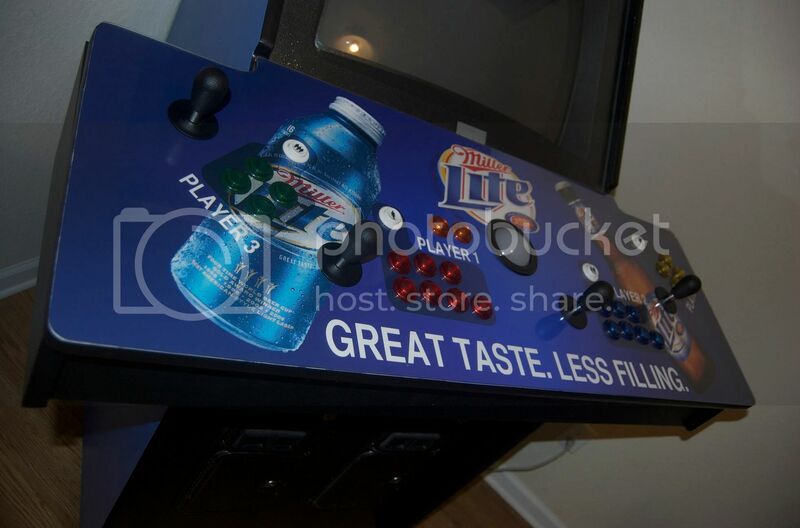 Blue led indicates the 8way mode. Leds are powered by a micro lever switch on the backside of the cp. 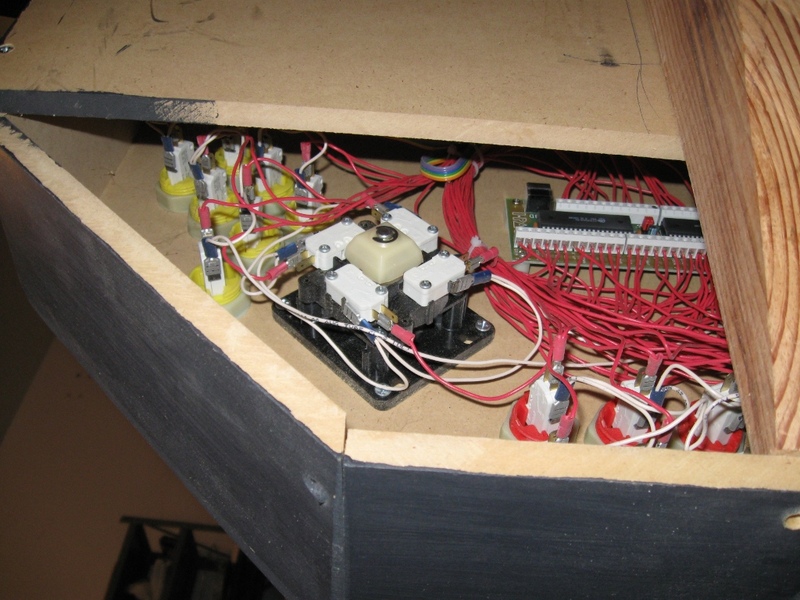 The lever on the side of the joystick activates the microswitch lever. In one position (engaged) it lights one led, and when disengaged it lights the other. Though not really the cp, this piece allows for plugging in various controls or accessories. Mounted on the cab under the cp. I LOVE those 4-8 way indicator leds. Fantastic idea! Great artwork too! WOWEE...that is a thing of beauty. Just the wiring alone took some SERIOUS patience. Ill take more pics of the inside this week end, need to change out 1 LED that went bad. 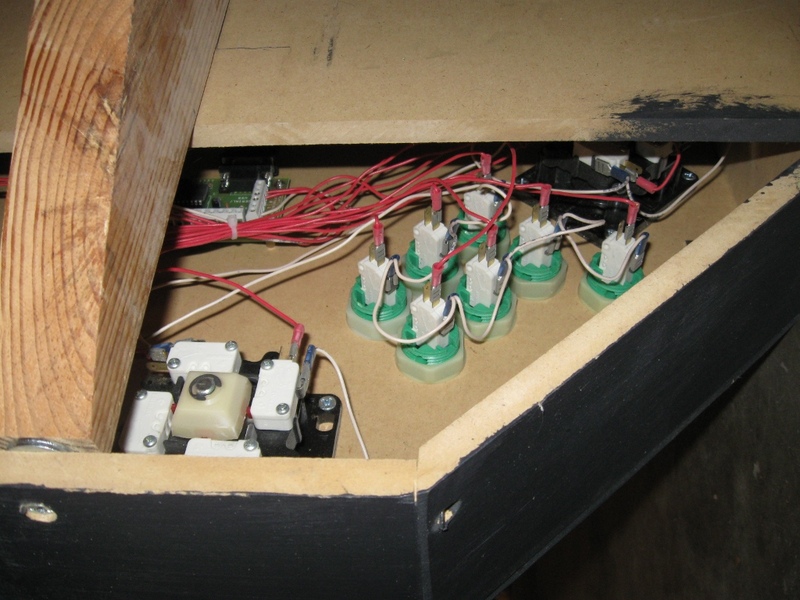 This is my assembled control panel. Still requires a few adjustments. Why didn't player 3 get their own button color? Nevermind, it's purple. Hard to tell in the picture. 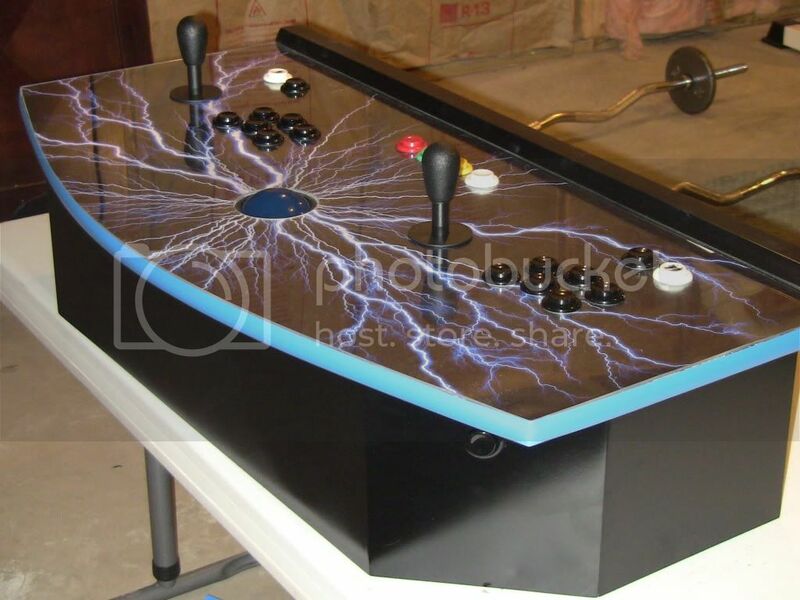 4-player custom panel designed for many game configurations, but made especially for Discs of Tron, Smash TV, Heavy Barrel, X-Men, Centipede, and Galaga. Hopefully your startup sound is the great taste, less filling chant. 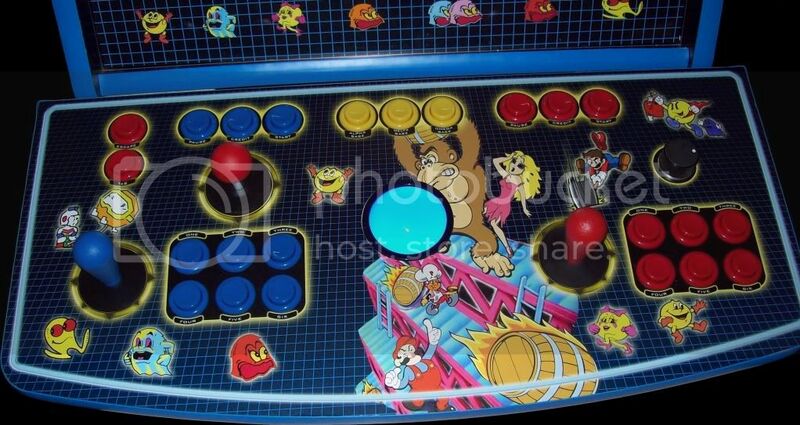 CP for my Donkey Kong Themed Bartop. 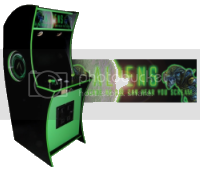 CP for my Centipede Cab. 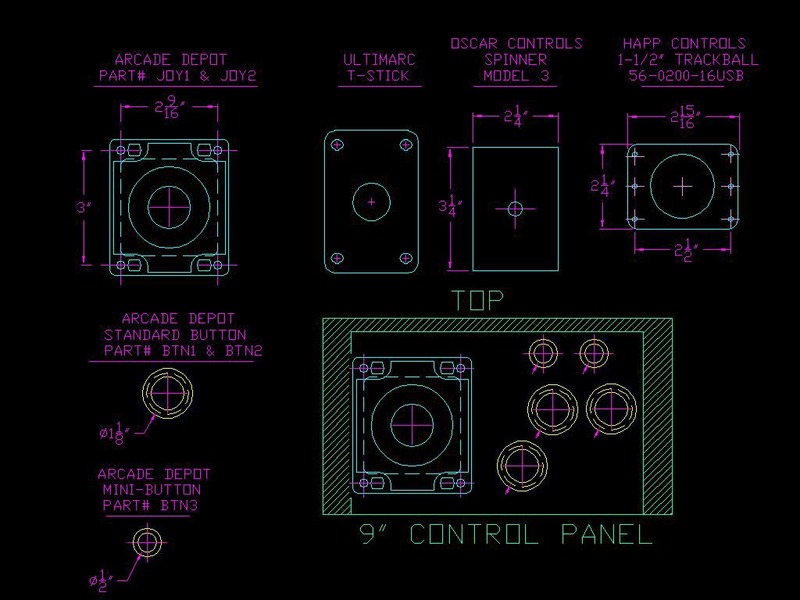 My control panel made from scratch for my Neo Geo MVS conversion. 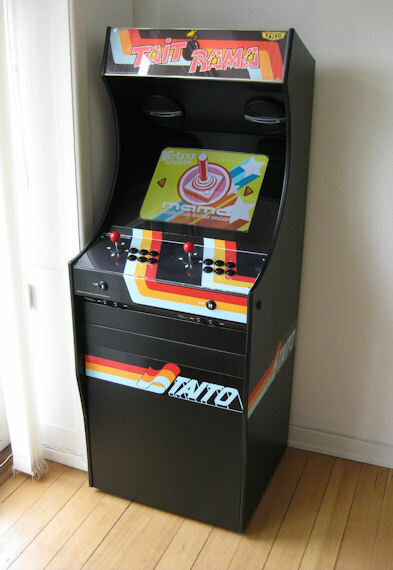 The cabinet was a Taito Jungle Hunt, that had been converted to a Universal Mr.Do. I'm a CNC programmer / setup person by trade so I made this CP on the CNC mills at work. Parts used are all Happ Competition. Rock Out with Macaque Out! 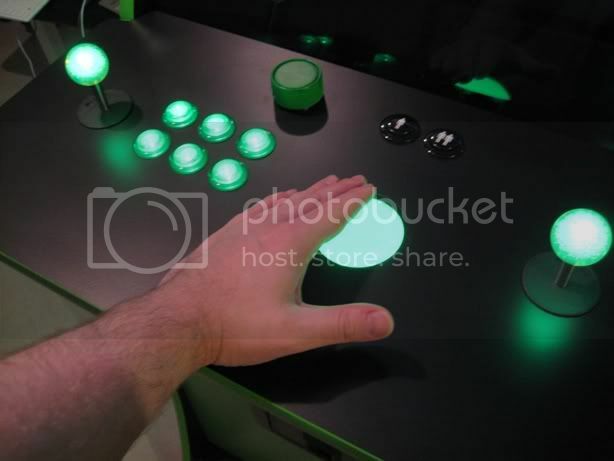 As a MAME noob I've gotta say that these pics are intimidating. Mine isn't going to look nearly this good. Loving your color scheme, man. Wowsers! That is one of the coolest cabs I've seen in a long time. Got my control panel put together finally. Just a panel, it's my first. Got a lot of ideas and help from this forum / wiki and some from the Slagcoin site. The background Marvel poster idea I got from someone here, but I forget who. I hope they don't mind. Ultimarc U360 joystick and spinner. 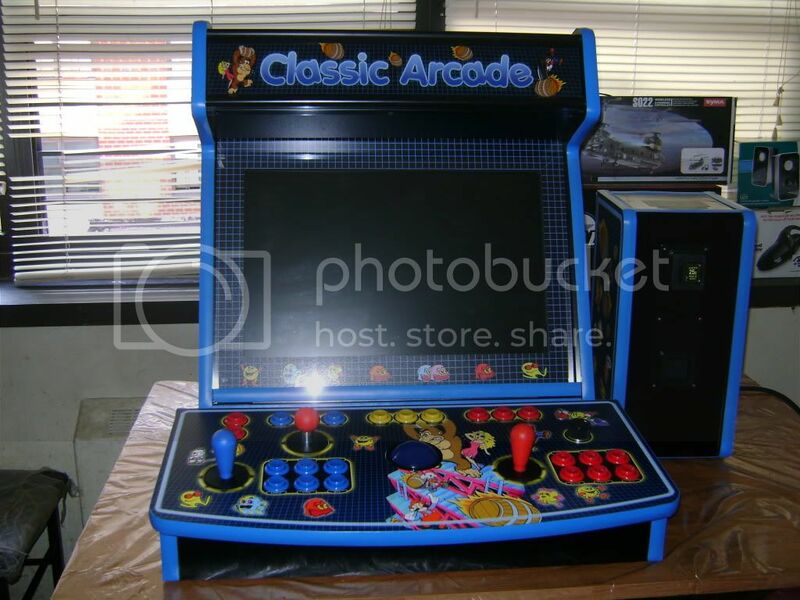 Trackball is from Xarcade. The buttons are 24mm Seimitsu's. Still not totally complete. The bottom cover needs to be stained and I need to add a plug to the hole for the cords. Also having some problems with windows not recognizing the trackball when I plug it in sometimes, but I'll work that out. Nicely done! 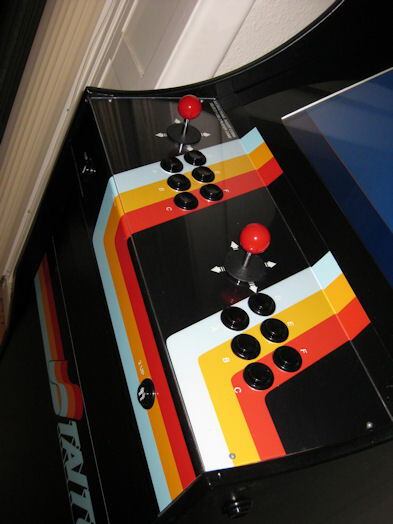 I like how you undermounted the stick and trackball, and recessed the side buttons. I had similar probs with my trackballs and U360's till I got a hub with a decent power supply. Thank you. I had a couple of false starts before I settled on this design. The recessed side buttons I got from the Slagcoin site and they are nice. I'm going to have to set up some pinball sims just to use them more. 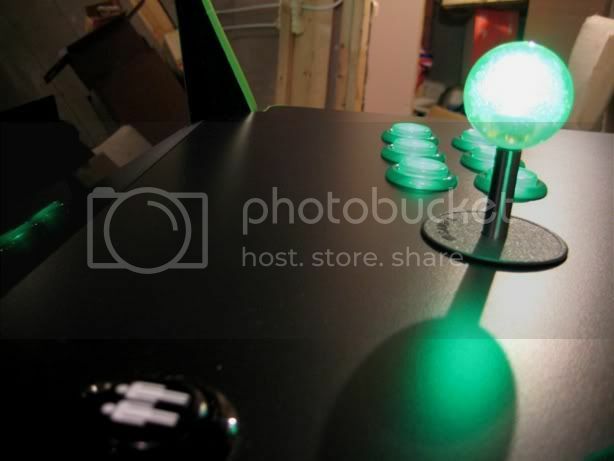 The stick and trackball mounting I got from here. With the plexi top and poster background it came out pretty nice, but I can still see all the flaws. I have the U360 run direct out the the computer's USB. The Spinner and the Trackball are on a hub and run out on one cord to the computer. I knew the U360 requires either a direct USB connection or a powered hub (probably from one of your posts). But the Xarcade Trackball just seems to be hit or miss when I plug the hub in. Sometimes it works, sometimes not. It seems to work 100% when I do a shut down and cold boot up. Annoying since I'd like to be able to just plug in and play. Adding in my resources here for archival purposes. 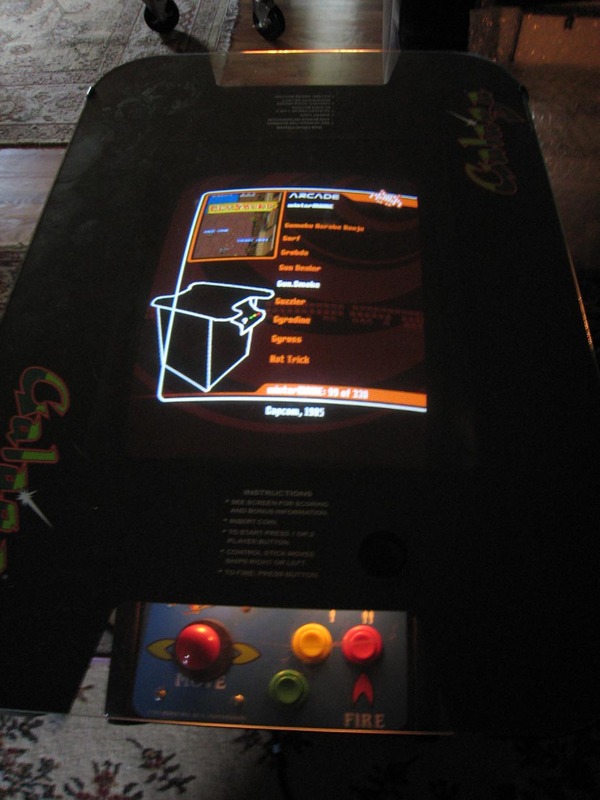 Midway cocktail (formerly a galaga table), metal CPs. This was all done about 2 years ago, things may have changed since then. 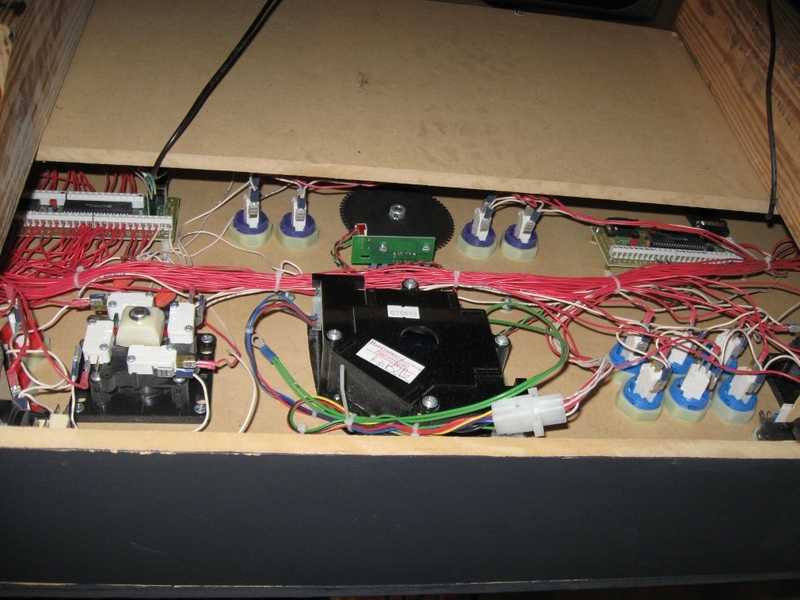 This is my first control panel that I built around 4 years ago. It's a bit dusty because I am currently rebuilding it in another cabinet. I've realized the things I want better and I am now building a simpler CP. This is the first portion of a cabinet project I've been mulling around since downloading a very early version of MacMAME back in 1997 or so. 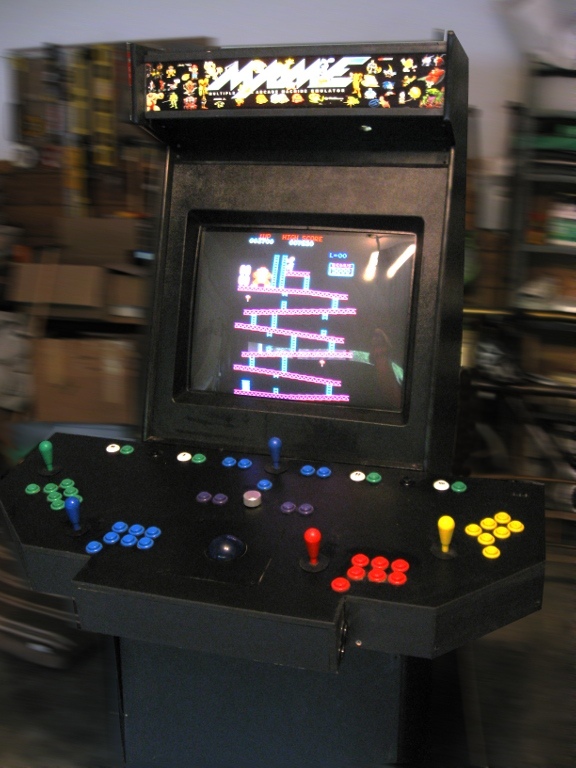 It got put off while I had a life (many of the parts were purchased several years ago, just before I got engaged and then married), but this summer I finally got motivated enough to build the control panel, and completed that work this weekend. It passed the niece and nephew test with flying colors. Nobody is ever going to mistake me for a carpenter, so I kept it simple--and in fact got a buddy with a serious Tim Taylor complex to cut out and drill the basic parts after I completely buffooned a first attempt. 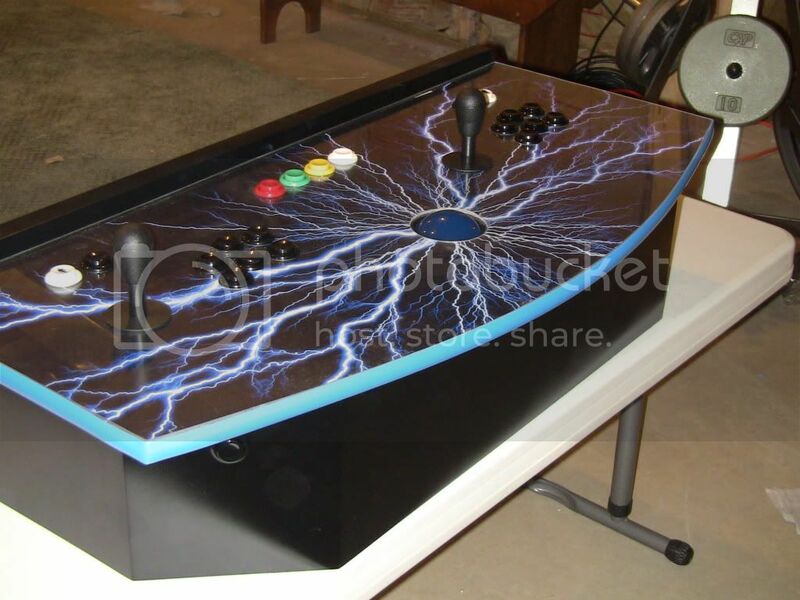 I did the design, routing, painting, lamination, installation and all the electronics work myself. As pictured here, it's running through an Intel Mac Mini running MacMAME .103, connected to a 50" Panasonic plasma TV. 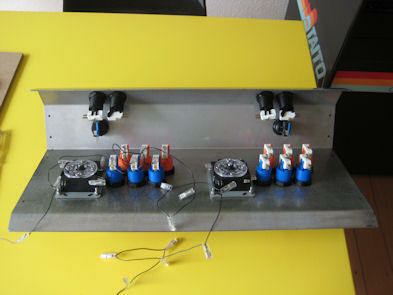 I'll mate this with a more traditional cabinet, Hackintosh CPU and 20" 4:3 LCD monitor once the cabinet is constructed. For now, I'm taking a break and playing some games! Whoops--aiming for modify and hit quote. Mods, please feel free to delete. My cousin runs a sign shop and has offered to help me with my artwork, so I'm hoping that works out pretty well. My Project Thread - Yahrrrcade! dermoerder, that is a great theme, I love that CP! Anyway for a first attempt at a build how did I do? I think it looks really good and have no problems with the colors.